Arguably the best and most popular Android phone maker in the market right now is back with the Samsung Galaxy S8 and S8+. After the PR nightmare that was the Note 7, Samsung clearly needs a winning phone to make it up to their loyal customers. Add up the fact that they are releasing their line-up ahead of the much anticipated 10th anniversary iPhone which will be released later this year. Good thing, Samsung seems up to the task if early reviews and impressions are to be believed. The glass and metal make of the phone still gives it a premium feel which in matched by the new infinite display that supports mobile HDR for better image quality. The camera is superior as always plus now it has an upgraded 8MP front camera with f/1.7 aperture and autofocus guaranteed to feed the growing selfie obsession of the mobile phone market. 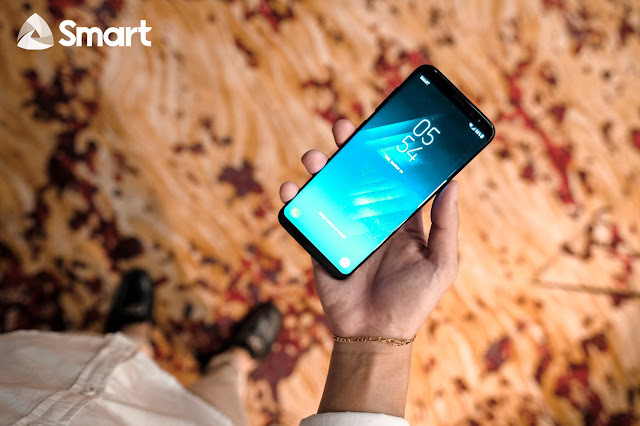 The fingerprint sensor has relocated to the back of the phone to give room for its infinite display but it also has an iris scanner as an alternative. Bixby, Samsung's version of Siri is dotted throughout the OS and has a dedicated button under the volume keys on the side. Memory is expandable up to 256GB and it has a very considerate headphone jack for people who miss it from the competition. The #SmartGalaxyS8 and S8+ will be available for pre-orders from Smart beginning April 17. More details about the plans and prices will be posted soon. You may follow @LiveSmart on Twitter and Instagram for updates.